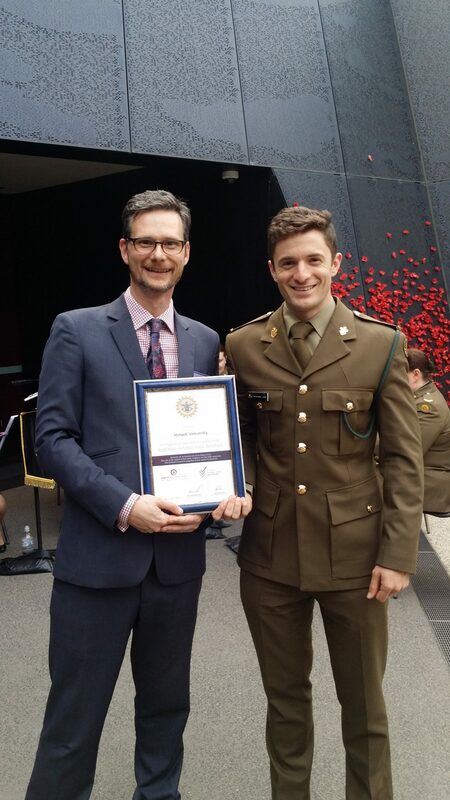 Politics and International Relations Senior Lecturer Dr Ben Wellings was nominated for an Employer Support Award by The Defence Reserves Support Council, on behalf of Monash University, by Politics and International Relations tutor Chris Arnel, an Army Reservist. The “Employer Support Award” recognises the contributions made by employers of Reservists. The Defence Reserves Support Council sponsors the awards, which publicly acknowledges employers at the State and Territory level who support the service of Reservists. Chris, who has worked at Monash since 2016, is currently an Officer Cadet (trainee officer) with the Australian Army Reserves. But having recently passed an incredibly competitive selection process, he will be take up a job in Canberra with the Australian Federal Police in January. Chris said he nominated Ben for the “excellent support” that Ben, and the University, has provided him with while he balances his time in the Army Reserves with his work at Monash. “There have been times when my training with the Army conflicted with my work at Monash, as I'm required to undertake weeks of training at a time. In these situations, Ben supported me by alleviating my workload and offering his understanding of my situation,” Chris said. Ben commended Chris on his organisation and communication skills, which he says has helped make the balancing process as smooth as possible. “Anyone who has worked with Chris will attest to his professionalism and the positive impact he has on teaching within the section,” Ben said.